We’d love your help. Let us know what’s wrong with this preview of Thin, Rich, Pretty by Beth Harbison. Twenty years ago, when they were teenagers, Holly and Nicola were the outsiders at summer camp. Holly was the plump one, a dreamer who longed to be an artist. Nicola was the shy, plain one who wanted nothing more than to be beautiful. Their cabin nemesis was Lexi. Rich, spoiled, evil Lexi. One night, Holly and Nicola team up to pull one, daring act of vengeance. But they never dream that this one act will have repercussions that will reach into the future, even twenty years later. And they never realize the secret pain that Lexi holds very close, and how their need for revenge costs Lexi a great deal. Today, Holly is a successful gallery owner, who has put her own artistic dreams on hold. She struggles with her weight and for approval from her constantly-criticizing boyfriend. Nicola, is an almost-famous actress who believes that one little plastic surgery fix is just what she needs to put her over the edge into fame. And Lexi…Lexi is down on her luck and totally broke. To ask other readers questions about Thin, Rich, Pretty, please sign up. Beth Harbison is one of my new favorite authors after having discovered her in fall of 2009 when I read Shoe Addicts Anonymous (2007). The events that transpired in Secrets of a Shoe Addict (2008) even inspired me to open a new business (ahem), although short-lived, was very lucrative for me. I highly encourage you to pick up a Beth Harbison novel if you haven't already; I promise you'll fall in love. 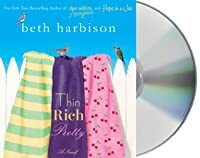 Thin, Rich, Pretty begins twenty years ago, when three teenage girls are all outsiders in their Beth Harbison is one of my new favorite authors after having discovered her in fall of 2009 when I read Shoe Addicts Anonymous (2007). The events that transpired in Secrets of a Shoe Addict (2008) even inspired me to open a new business (ahem), although short-lived, was very lucrative for me. I highly encourage you to pick up a Beth Harbison novel if you haven't already; I promise you'll fall in love. 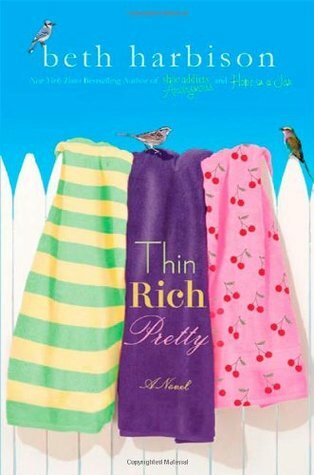 Thin, Rich, Pretty begins twenty years ago, when three teenage girls are all outsiders in their own way and spending time at a summer camp. Holly and Nicola are best friends, whereas Lexi is a rich, beautiful girl whom the chubby Holly and shy Nicola envy -- and hate. Twenty years later, Holly and Nicola are still friends striving to overcome the same insecurities they worried about years ago, while Lexi finds herself alone and struggling to make ends meet financially. With a crude event that took place years ago at summer camp put behind them, the three women still find that the experience in question still overshadows their present-day lives. As Holly, Lexi, and Nicola work toward their goals of becoming thinner, richer, and prettier respectively, they eventually discover that the past can finally be put behind them as new, beautiful, and major life changes await. I personally enjoy Beth Harbison's novels because 1) they are truly laugh-out-loud hilarious and 2) they are so nostalgic! I love Harbison's pop-culture references to the 80s and 90s being a product of those times myself, so the value of her novels is sky-high for me. Just as Sandra's character regaled us with funny, yet horrible dating stories in the Shoe Addict series, Holly's worthless relationship with boyfriend Randy cracks me up just as much, if not more! Thin, Rich, Pretty demonstrates the greatest of camaraderie between female friends and pokes fun at insecurities we all encompass to some degree. Although some aspects of the plot are unrealistic and silly, that's exactly just the point -- and it makes the novel that much more fun and enjoyable. Every character in Thin, Rich, Pretty gets what he or she deserves! Beth Harbison is just too fun, simply put. You've got to read all of her novels. In addition to the Shoe Addicts novels, Harbison released Hope in a Jar in 2009 and her newest novel, Always Something There to Remind Me, will be released later this summer in 2011. I loved this book. It was completely different than the books I usually read - it was not about women in relation to the men in their lives. Rather, it was about friendship, lives forged by events that are both in our control and beyond our control, and coming into what yo always wanted, to find it's not necessarily the dream you had held. Thin, Rich, Pretty follows three woman in two different time periods - in sleep away camp when they were 13 and in the present. Holly and Nicola formed a life- I loved this book. It was completely different than the books I usually read - it was not about women in relation to the men in their lives. Rather, it was about friendship, lives forged by events that are both in our control and beyond our control, and coming into what yo always wanted, to find it's not necessarily the dream you had held. Thin, Rich, Pretty follows three woman in two different time periods - in sleep away camp when they were 13 and in the present. Holly and Nicola formed a life-long friendship at camp twenty years ago, and together they despised the "popular" girls, including Lexi, a girl they perceived to be a spoiled brat. Twenty years later, Holly and Nicola, while living on opposite coasts, are still close friends. Holly is still slightly overweight and she runs an art gallery. Nicola is an actress in Hollywood. Lexi, however, has lost it all when her father died and left everything to her wicked stepmother. Each woman wants something - Holly wants to be thin, Nicola wants to be pretty, and Lexi wants her money back. Each woman is single, trying to make her way, and finding that sometimes you must be careful what you wish for. Unlike other "chick lit" books, this is a story of friendship, of life, and of correcting wrongs. It's also a story about not judging a book by it's cover. Each woman finds out something about another that changes her perceptions and gives the story so much to think about. Completely predictable. I keep searching for good quality chick lit, but this doesn't make the list. I think the author got excited about using a "20 years later" theme because it was a good round number. But I had no idea how these girls became who they were at age 33 (all single and without kids, but barely any mention of past loves) because she just doesn't fill in the holes for us. The worst example of this was the rich girl who still lives in her parents' house at age 33 and who has never w Completely predictable. I keep searching for good quality chick lit, but this doesn't make the list. I think the author got excited about using a "20 years later" theme because it was a good round number. But I had no idea how these girls became who they were at age 33 (all single and without kids, but barely any mention of past loves) because she just doesn't fill in the holes for us. The worst example of this was the rich girl who still lives in her parents' house at age 33 and who has never worked? What on earth has she been doing during her adult life, and why didn't she marry a rich guy if she's so pretty and wealthy herself? It barely mentions what she has been doing to fill her time other than a short stint in art school. Saying they were all 26 would have been much more believable. Lexie, Holly, and Nicola first met twenty years ago at Summer camp where a life long friendship was made between Holly and Nicola, and something very special is taken from Lexie. Twenty years later, their paths cross once again. Holly is tired of being "the fat girl" and starves herself into losing 20 pounds thinking it will buy her love. Nicola is tired of being ugly and gets a nose job hoping it'll boost her acting career, but the change is so dirastic she is no longer marketable. Lexie, who g Lexie, Holly, and Nicola first met twenty years ago at Summer camp where a life long friendship was made between Holly and Nicola, and something very special is taken from Lexie. Twenty years later, their paths cross once again. Holly is tired of being "the fat girl" and starves herself into losing 20 pounds thinking it will buy her love. Nicola is tired of being ugly and gets a nose job hoping it'll boost her acting career, but the change is so dirastic she is no longer marketable. Lexie, who grew up with everything she ever wanted, loses her fortune and has to make it on her own with no life skills. Each learn that the one thing they thought was standing in the way of their happiness is actually the thing that makes them special, and they fight to get it back. This was a referral from mom. She said it was a fast breezy read and it was...it just wasn't as good as it could have been. The book alternates chapters between the present and 20 years ago and then is divided among three characters. I didn't really care about the characters because I didn't really get a chance to know them. The book had potential, but the author should've picked one character and focused on that. Cute concept. I liked the back and forth from summer camp to present day. It's a nice message -- learning to love ourselves as is. Light, fluffy, easy read. A very long buildup, no real character developments, several impossible-to-the-point-of-absurdity coincidences and of course everything works out perfectly for everybody in the end. This is normally the kind of book I like to read as a palate cleanser after a serious, real book. This was fun, fluffy, very light chick lit, good for an easy escapist read. Holly, Nicola and Lexi first meet at summer camp. Lexi was the mean girl who hung out with even meaner girls. Holly was overweight and very self-conscious. Nicola was painfully shy and never felt pretty thanks to her perception of her nose. Holly and Nicola became fast friends. They often found themselves enduring the wrath of Lexi and her friends. Until one they, both decide to get their revenge. Fast forward twenty years later. Holly is now dating Randy and they’ve just gotten engaged. Well, pre Holly, Nicola and Lexi first meet at summer camp. Lexi was the mean girl who hung out with even meaner girls. Holly was overweight and very self-conscious. Nicola was painfully shy and never felt pretty thanks to her perception of her nose. Fast forward twenty years later. Holly is now dating Randy and they’ve just gotten engaged. Well, pre-engaged. Randy claims he wants to marry her, however she only needs to lose a few pounds first. Nicola is an actress living in LA. She’s had success with one major movie, and is still trying to make it big. Unfortunately she still doesn’t feel pretty enough, so she decides to have plastic surgery. After the bandages are off, she no longer recognizes herself. And Lexi… Well, Lexi just recently lost her father. He changed his will and left everything to her step-mother. Lexi has just a month to move out of her family home and find a job. This will be the first time she will be employed. While each woman continues to struggle with issues of her past, Holly accidentally bumps into Lexi while shopping. Thoughts race back to their time at summer camp and Holly feels compels to make things right with Lexi. She solicits the help of Nicola and to two set out to make amends. Thin, Rich, Pretty is a book that deals with common issues that haunt girls and can carryover into adulthood. It also speaks to people are more than what we see at first glance. Alternating between the time spent at summer camp and the present, the reader gets a feel for the relationship between the three women. I checked out this book from the library on a whim since it's the last of my summer holidays before college starts and I have to say, I really like this! :) The first few chapters are a lil disconcerting to me because it flips from the present to 20 years ago where the girls were in camp, and back to the present. But it wasn't that big an issue when it gets to the middle. What I really dig about this book is the relationships between the characters that Beth Harbison had so nicely weaved. Holly I checked out this book from the library on a whim since it's the last of my summer holidays before college starts and I have to say, I really like this! :) The first few chapters are a lil disconcerting to me because it flips from the present to 20 years ago where the girls were in camp, and back to the present. But it wasn't that big an issue when it gets to the middle. What I really dig about this book is the relationships between the characters that Beth Harbison had so nicely weaved. Holly and Nicola are still firm friends 2 decades on; Lexi has a few surprises herself. While yes the ending is predictable, you'd find yourself rooting for them especially Lexi becase they all have personas that one can relate to- be it wanting more money, or staying thin because of societal pressures, or down on your luck after years of being cocooned in one's luxury nest. Another good book from Harbison! I liked the friendships and the flashbacks. It was neat how she developed this story. Throwing a love relationship in the book is always a high point for me as well! I liked this book. It was fun and easygoing. I especially liked how the book showed the viewpoint of a "mean girl", and what that revealed. The message of the book is that you don't have to be traditionally beautiful, thin, or rich to be happy. Sometimes I felt it took things a bit far...aiming for the message that you will be actually be happier if people see you as ugly, you're overweight, and you're financially struggling. This book was a fun read. Light-hearted and reminiscent of a familiar time and familiar places. This delivered on what it purports to be — a book from the pink and purple covers row of books, as my sister would say. I could relate to the struggle of Lexi, Nicola and Holly — blessed with so much, but focused on something that threatens to rob them of the joy of those blessings. I will read more Beth Harbison’s books. Beth Harbison has most certainly made my list of favorite authors. I could totally relate to each of the story's three main characters in some form or another. This was a definate "couldn't put down!" Ugh, this book started out bad and just kept getting worse. I understand the point the author was trying to make...everyone is beautiful just the way they are...but it couldn’t have been more cliche than this. A fast, frothy, formulaic bit of chick-lit. THIS is what one should be reading after a head injury. I felt I could totally relate to Holly & Nicola as camp misfits - story of my life, man. Fun and easy to read, did not require any mental energy. I could not stay engaged in this book whatsoever. It took me a very long time to finish it and I was never able to feel connected to the characters. Fun. Easy beach read. Great for a pallet cleanser between more serious books. I liked the characters and the lessons they learned. This was an easy read, mostly conversational - happy ending. Not a great literary work but good story. Easy summer mindless read. A simple but good story about friendship that lasts over the years. This story is a little predictable but not dull. Needed something to listen to while I did laundry. Did the trick. 3.5 stars and better than I thought it would be! I liked the strong female characters in this book. A good reminder that the grass is not always greener and to appreciate what we have. It was an adorable, though some parts of the plot were predictable, story. In a twist of the normal review, I want to start this by saying I absolutely love listening to Orlagh Cassidy! So much so that I found this book by searching through her narrations on audible. I had read Driving with the top down which is also by Beth Harbison, so I knew this was a good choice, especially with Orlagh as the narrator. Her voice is just so beautiful, soothing and animated to me. As teenagers at summer camp, Holly and Nicola were not part of the “in” crowd. A bit on the heavy side, In a twist of the normal review, I want to start this by saying I absolutely love listening to Orlagh Cassidy! So much so that I found this book by searching through her narrations on audible. I had read Driving with the top down which is also by Beth Harbison, so I knew this was a good choice, especially with Orlagh as the narrator. Her voice is just so beautiful, soothing and animated to me. As teenagers at summer camp, Holly and Nicola were not part of the “in” crowd. A bit on the heavy side, Holly wanted to be an artist, while plain, shy Nicola wanted only to be beautiful. Rich, spoiled Lexi ruled their cabin and did everything she could to make their lives miserable. On a whim, Holly and Nicola decide to pay her back for all the hateful things she has done. Their actions that night will backfire in a way that reaches them far into the future. Holly, now a successful art gallery owner and Nicola, an actress with one major role under her belt are both searching for something in their lives that they believe will make them happier. Holly nearly starves herself silly for her boyfriend who criticizes her constantly and Nicola undergoes plastic surgery to make herself more attractive. Lexi, on the other hand, has been left high and dry by her father and stepmother and is completely broke. She will have to get a job for the first time in her life. Holly wants to be Thin. Lexi wants to be Rich. Nicola wants to be Pretty. This is the story of how these three women come to realize that the dreams they have been chasing are not the ones that will make them happy, but instead find that if they are willing to accept it, the help they are looking for is right next to them, and how they come to realize that they are so much more than just Thin, Rich, and Pretty. Beth Harbison grew up in Potomac, Maryland, in the shadow of Washington, D.C. Apart from the occasional irritation at being held up in traffic by a presidential motorcade, she has remained fairly uninvolved in the politics that define her home town. Her latest novel, ONE LESS PROBLEM WITHOUT YOU, comes out July 26, 2016.